He married Lillias Pomeroy Dulles, Dec 7 1940, Manhattan, New York, New York.1,8,9 Lillias, daughter of John Foster Dulles & Janet Pomeroy Avery, was born Jun 16 1914.1,10 (John Foster Dulles [1888-1959] was U.S. Secretary of State 1953-59 under President Eisenhower; Dulles International Airport near Washington, D.C. was named for John Foster Dulles). 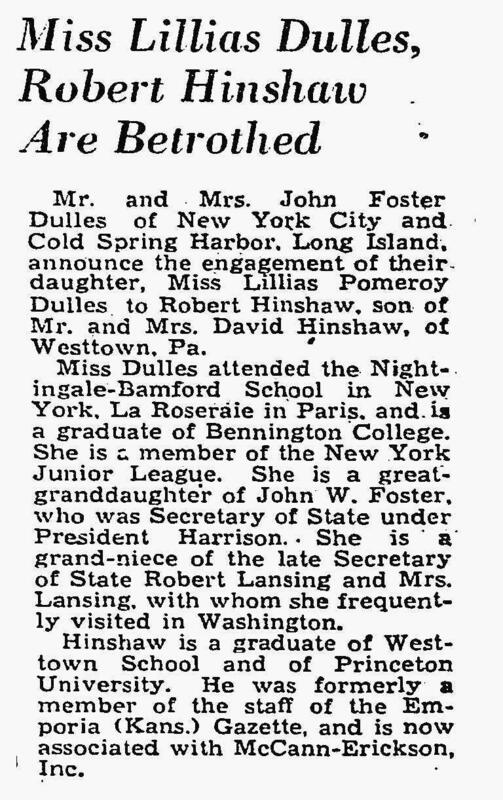 Robert and Lillias' engagement was reported in the "New York Times" (New York, New York) on October 24, 194011 (see scan below). Married. Lillias Pomeroy Dulles, 25, daughter of John Foster Dulles, international finance expert and senior partner in Manhattan's potent law firm of Sullivan & Cromwell; and Robert Hinshaw, 25, Princeton-schooled advertising man; in Manhattan. New York (AP) -- Mrs. Lilias Dulles Hinshaw, daughter of State Secretary John Foster Dulles, was to graduate Tuesday from Union Theological Seminary, looking forward to a career in the Presbyterian ministry. Two years ago Avery R. Dulles, the state secretary's youngest son, was ordained a Roman Catholic priest. Dulles himself is a prominent Presbyterian layman. Mrs. Hinshaw, 43, is the wife of Robert Hinshaw, a public relations executive who is a Quaker. They have three children. Mrs. Hinshaw told an interviewer she hopes to find a position as an assistant minister in some New York church. New York (AP) -- The daughter of the late John Foster Dulles was licensed to preach by the Presbytery of New York. Mrs. Lillias Hinshaw is the second of the Dulles children to study theology. His son, Avery, is a Jesuit priest. The other son, John Dulles, is an engineer. Lillias Dulles Hinshaw, a Presbyterian minister and the daughter of the late Secretary of State John Foster Dulles, died after a long illness Monday at the Memorial Sloan-Kettering Cancer Center. She was 73 years old and lived in Manhattan. Mrs. Hinshaw served as an assistant to the ministers at the Madison Avenue Presbyterian Church, in charge of pastoral visitations, from 1958 to 1969, when she retired. A graduate of Bennington College and the holder of a master's degree in teaching from Columbia University, Mrs. Hinshaw studied for the Presbyterian ministry at the Union Theological Seminary in Manhattan from 1954 to 1958. She is survived by her husband, Robert Yost Hinshaw; two daughters, Janet H. Shabon, of Rutledge, Pa., and Lila H. Erlandson, of Livermore, Calif.; two sons, David Yost Hinshaw, of Ithaca, N.Y., and Foster Dulles Hinshaw, of Cambridge, Mass. ; two brothers, John W. F. Dulles, of Austin, Tex., and the Rev. Avery Dulles of Washington, and five grandchildren. Robert Yost Hinshaw, a public relations executive and consultant, died Monday at the age of 96 at his home in Ithaca, NY. He was born in New York City on July 4, 1917, son of David and Augusta Wiggam Hinshaw. He lived many years in New York City and for the past 45 years in Ithaca. He was a Quaker, graduated from Princeton University, and served in World War II. In the 1930s, Robert worked as a reporter for famed editor William Allen White's Emporia Gazette in Kansas. In the 1940s, Robert served as a campaign advisor to New York Governor Tom Dewey in his two presidential campaigns. He also served as a close advisor to the presidential campaigns of Dwight Eisenhower and Ronald Reagan. During the 1940 Dewey campaign, he met and subsequently married Lillias Dulles Hinshaw, the daughter of the late Secretary of State, John Foster Dulles. His wife Lillias died of cancer in 1987. Robert was an avid tennis player. One of his greatest joys in life was teaching promising tennis players in the community. He is survived by two daughters, Janet Hinshaw-Thomas, and her husband Jamiel of Rutledge, PA, Lila H. Erlandson and her husband Alvin, of Livermore, CA; two sons, David Y. Hinshaw, New York City, and Foster D. Hinshaw and his wife Donna Stone, Cambridge, MA; sister, Sarah Ann Rickerman of Newark, DE; four grandchildren; and four great grandchildren. Funeral services will be celebrated by Rev. Richard Towers on Saturday, July 27, 2013 at 10 a.m. at the Bangs Funeral Home. Interment will follow at Frear Memorial Park. Obituary of Lillias Pomeroy Dulles. 1920 census, Wichita Falls, Wichita County, Texas; roll T625-1858, ED 121, page 6A, line #28, dwelling #84, family #87. Posting Jan 16 2002 by Miriam Medina () to NYBROOKLYN-L.
Robert Yost Hinshaw & Lillias Pomeroy Dulles engagement; "New York Times" (New York, New York), Oct 24 1940; http://www.ancestry.com. "The Lethbridge Herald", May 28 1958; http://www.ancestry.com. "The Lethbridge Herald", Oct 7 1959; http://www.ancestry.com. Ancestry Family Tree data "Carswell Family" posted by "JSweit85731".